Description: Sanderlings are the size of large sparrows with short, black legs and short, straight, black bills. They appear rather chunky. In breeding plumage, they are rufous-orange on the shoulders, back and upper breast and white below. In nonbreeding plumage, they appear to be the whitest of the sandpipers. In flight, the white wing stripe bordered by dark is conspicuous. 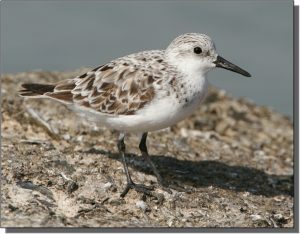 Similar Species: Sanderlings are most likely to be confused with other small calidrine (birds belonging to the genus Calidris) sandpipers during the nonbreeding season. 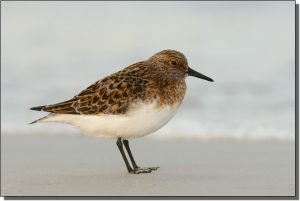 However, Sanderlings are the lightest colored of the sandpipers during the nonbreeding season. They are not likely to be confused with other North American sandpipers in their breeding plumage. Comments: Sanderlings are among the most northerly breeding shorebirds. They are found throughout the world on sandy coastal beaches during the nonbreeding season. On coastal beaches, Sanderlings are commonly seen running back and forth between surging and receding ocean waves. Within the Great Plains, they are commonly encountered during fall migration on river sandbars, shallow alkaline and saline lakes and reservoirs.